Westchester County Legislator David Tubiolo (Yonkers & Mount Vernon) this week hosted his 8th ‘Senior Movie Matinee / Senior Afternoon Cinema’ trip for seniors, as part of his on-going efforts to fight senior isolationism. Tubiolo, who chairs the County Legislature’s Committee on Seniors & Constituencies, led the group of seniors for an afternoon at the Jacob Burns Film Center* to see the film, “An Education” (2009) starring Casey Mulligan, Peter Sarsgaard, Alfred Molina, Rosamund Pike and Emma Thompson – a coming-of-age-drama film based on a memoir of the same name by British journalist Lynn Barber. Over 30 senior film buffs attended, with their only expense being the $9 movie ticket. Transportation and refreshment costs were provided by Arts Westchester and Legislator Tubiolo. According to Tubiolo, his committee tackles many issues pertaining to the senior community such as, affordability, elder abuse, housing, isolationism, scams, transportation and more. “It’s wonderful to welcome Yonkers and Mount Vernon seniors to the Jacob Burns Film Center (JBFC). They have been here eight times for both our Senior Movie Matinee programs, as well as our newest series, Senior Afternoon Cinema. The films shown are selected to appeal especially to seniors and following the Senior Movie Matinees cookies and soda are served and Legislator Tubiolo treats them to popcorn and soft-drinks during the screening. 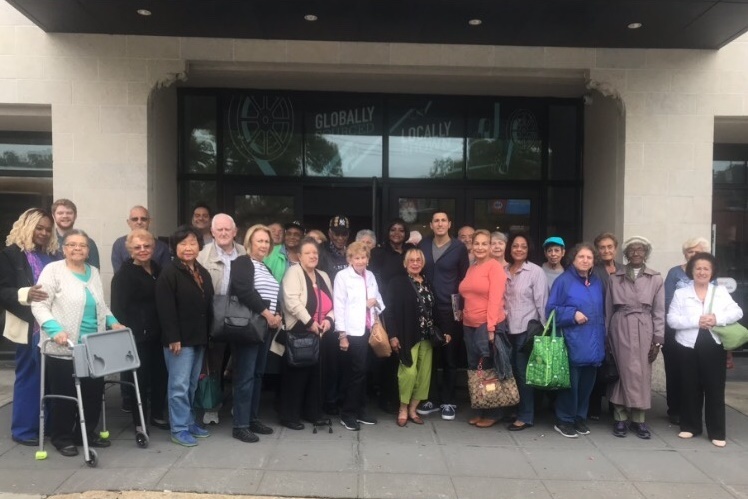 We thank Legislator Tubiolo for making the arrangements and giving Yonkers and Mount Vernon seniors the opportunity to come to Pleasantville for an outing that they always enjoy,” said Abby Popper, Programmer, Senior Movie Matinees / Senior Afternoon Cinema. If you are interested in one of these trips, please contact Legislator Tubiolo at (914) 995-2815, or email him at . *The Jacob Burns Film Center (JBFC) is a nonprofit cultural arts center dedicated to teaching literacy for a visual culture; presenting the best of independent, documentary, and world cinema; and making film a vibrant part of the community.